Expected goals is a stat where the probability is evaluated that any given shot will end up as a goal. Expected goals are based on a number of factors, such as where the shot was taken from and where the opposition defenders are at the time. The shot assumes it is being taken by someone of average ability in the league. To state the obvious , a shot from inside the 6 yard box in front of goal with no defenders around will have a very high probability it will end up as a goal. In essence it shows you what should have happened rather than what has happened. 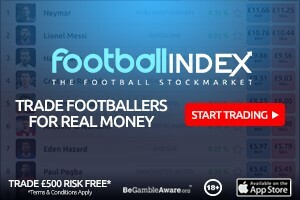 The expected goals are now all wholly from the excellent free site understat.com. 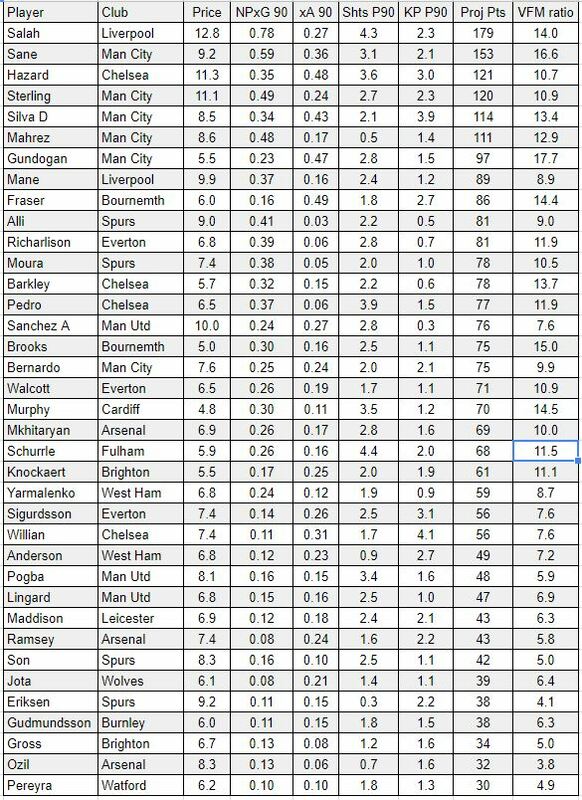 Everything is done on the basis of per 90 minutes played rather than per game. That’s so you can see how effective a player is on the pitch. This is just one part of ranking players it’s not the be all and end all. I do a player rankings series which uses more stats than just xG and xA. There’s no filtering here for gametime security or injuries. Here I have taken the Non penalty xG per 90 minutes (NPxG90) and the xA and converted them into goals and assist points and then ranked them by projected total points as if they were playing over the whole season 90 minutes each game. I haven’t added on appearance points, adjusted for average minutes or bonus points or clean sheets for defenders. It’s purely just the goals and assist points. There was a minimum minutes played of 200 minutes. Players don’t perform on a straight line with the stats. Some like Hazard and De Bruyne have shown they can over perform. Others like Ramsey have a history of under performing. I have not tried to adjust for this. That’s more for the player rankings articles. I have tried to pick relevant players. It’s impossible to rank everyone. This article is very time consuming and laborious and easy to make mistakes so apologies if there is any. Please point out any in the comments section. Value £m: The FPL price at the time of the article. In this case Monday 1st October. 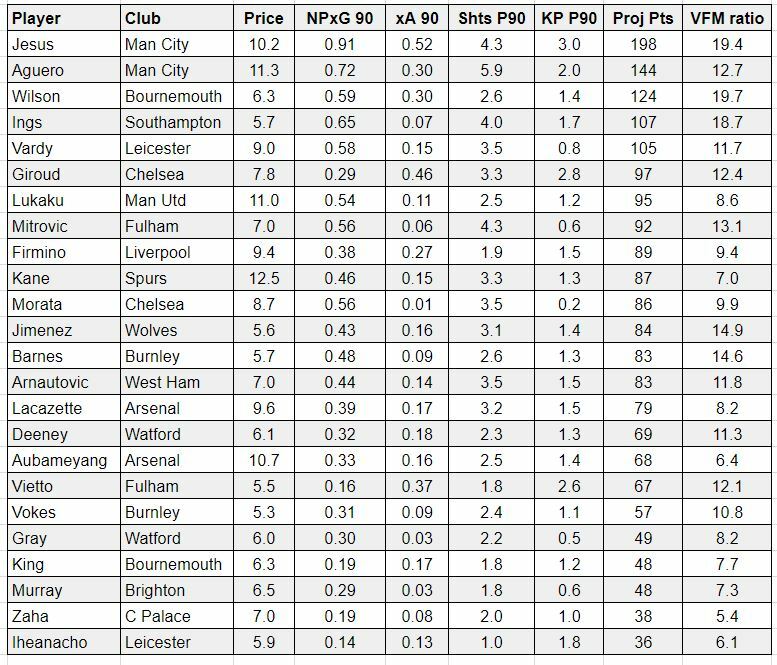 Again the players are ordered by projected FPL points that from the NPxG and xA stats to date assuming they played 38 games for 90 minutes. Only attacking stats not clean sheets. I’m starting to take a much keener interest in stats and it’s already improved my OR in my fourth season. But is it better to target teams that are over or underperforming? Arsenal, for example, seem to be hugely overperforming in terms of Team Attack at the mo. Hard to tell whether to jump on the bandwagon and make a play for e.g. Lacazette, Ramsay et al….or whether this is just a phase and they’ll soon regress to their true averages. In which case, it’s best to give them a wide berth…. There aren’t as many deviations in the Team Defence stats. The same of course applies to individual players. Which tack do other people take? If it’s best to take the chance with overperformers, is it time to be looking at De Bruyne again? Is it healthy to buy Kennedy due to his kind run of fixtures? Spurs’ Davies is top of your defender list but he’s not playing! 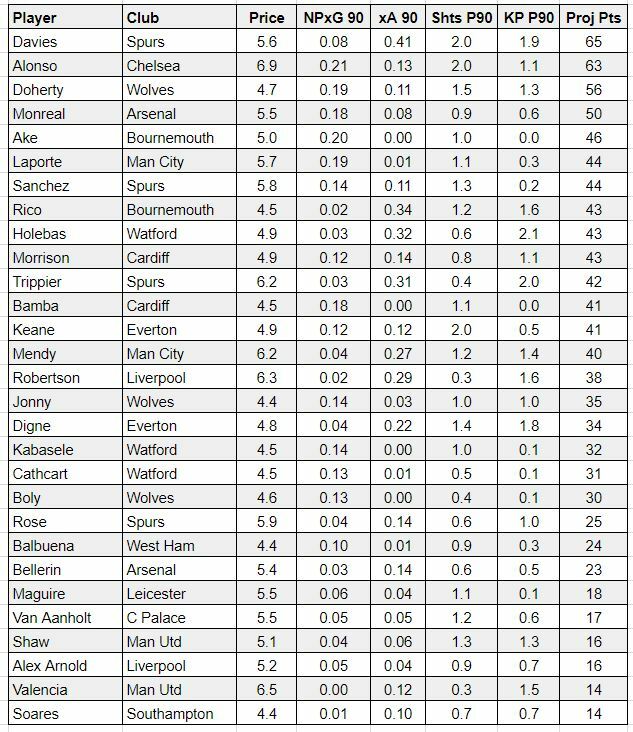 The table captures playsers that have played 200 minutes and Davies has played 278 so far this season in the PL which is why he’s on the list. It’s not filtered for those players who are nailed on for every game.